Siewers is a Richmond landmark supplying contractors and homeowners for generations. Always friendly and helpful. They stock most of the millwork unique to the area as well as products to satisfy today's projects. It's your traditional hometown home center on steroids. Keep up the good work. 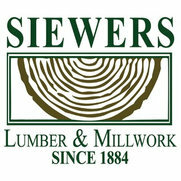 Siewers Lumber is a company known in the Richmond, VA area for quality lumber products. It is extremely important to us that the products we use on all of our construction jobs are the best. We want our projects done right the first time. So, we know that when we need materials Siewers will usually have them in stock and that they will be top notch, preventing jobs site delays and construction problems down the road. Please go see Bob Williams, sales rep at Siewer's. Nice and very pleasant to work with. They have hardwood and historical lumber that is very hard to find in Richmond.